Let’s go on an adventure. Close your eyes and imagine taking the most luxurious vacation of your dreams. Money is no object. You will be pampered in a stunning setting. It’s as if the staff can read your mind: Everything you desire appears before you even ask for it. You will never forget this incredible experience. On a quiet country road amid acres of photogenic Napa Valley vineyards, Frog’s Leap Winery is achingly evocative of the “old” Napa, before it became congested with tourists and tasters. Just off Conn Creek Road, which connects Highway 29 to the Silverado Trail, it seems miles and decades distant from traffic and glitz. The tasting room is in a classic-looking but recently built Victorian-style farmhouse surrounded by pretty and productive gardens. Wine On Tap! Save bottles, serve fresh samples! 4 to 8 kegs on tap. Eliminate waste from opening bottles. Prevent oxidation and spoilage. Store and serve at optimum temperatures. 1. Make a strong, positive first impression. Maybe we don’t have a greeter, so this role belongs to everyone. A warm smile and a word of welcome are all it takes. Be mindful to smile at each guest, even if you are not personally serving them. Remember that if the customer can see you, you are on stage. This is especially important for office staff who come into the tasting room on a mission: Yes, you too are on stage then, so play the part of a welcoming host. 2. Call customers by name whenever possible, and instill a warm sense of belonging. If you’re an avid Starbucks regular, your local barista knows your name, your very-specific order, and is ready with this knowledge every time you walk in the door. Whether you’re a fan or not, Starbucks’ business model for customer service is to anticipate your needs and deliver. If we emulate this example and remember our best customers, they will think of us as their winery and bring their friends to us as well. 3. Ask the right questions so we know how to fill their needs. Are they brand new to the winery, or are they club members? What kind of wine buyer are they: Are ratings important to them? Are they value buyers? Are they new to buying wine? We need to learn this about each guest because it changes the conversation and tells us how to serve them better. Asking open-ended questions will help us better assess these needs. 4. Anticipate their needs and pay close attention to detail. Do they need a pen, a napkin, a dump bucket, some water? What kind of silent cues are they giving that we can learn from? Notice their buying signals and actively listen to feedback to better anticipate their needs as well as to have a more effective, natural sales-close. People love to know they are being heard and understood. 5. Track customer preferences via POS-CRM. If we have kept good customer records, we can anticipate our guests’ needs and desires. When guests make an appointment for their visit, we can look them up in advance and be ready with their favorites based on what they’ve enjoyed in the past. Keeping records about anniversaries, birthdays, children’s names and ages, pets, etc., helps build a picture about our guest and makes the experience more personal when we bring up these details during their visit. Who is coming to visit? Are they celebrating a special occasion? Who is hosting this guest, and what do they need to know? Everyone has a part in the school play. We are either serving our guests or we are supporting those who do. Keeping records about our guests also helps the entire team get to know who they are…whether they did the hosting or not. Rather than just recommending a couple of restaurants when asked, why not make restaurant reservations? You help the customer and build goodwill for your winery with that local restaurant (be sure to use your name from ABC winery). Surprise and delight guests beyond their expectations with these concierge steps or by noticing silent cues and actively listening; these are great ways to show our service heart. Our guests are coming to us for an adventure, for an experience they will enjoy. We live the dream every day, so we need to remember to step back and appreciate it from our guests’ perspective. It’s not rocket science, but the smallest things we can do for our guests will go a long way. They will never forget this incredible experience at our WISE winery. 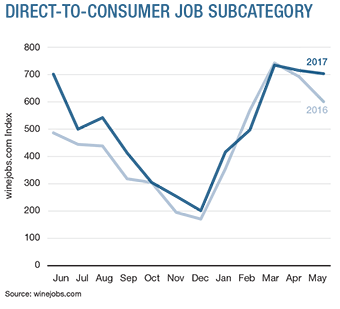 Direct-to-consumer hiring activity increased 17% to 711 in May 2017. This was the third consecutive month the index reading sat above 700. Owner John Williams co-founded Frog’s Leap 37 years ago, and he sustainably produces some 60,000 cases per year, by virtue of owning many of the vineyards and maintaining long-term grape contracts for others. The wines are sold on-site at truly old-fashioned Napa prices: The tasting room collection lists bottles from $25 to $55 (for estate-grown Rutherford Cabernet Sauvignon). The Frog’s Leap tasting room experience requires a reservation and a map. It comes at a modest cost, and it’s worth it: Real service in a charming old home environment, and no pressure or upselling. The tasting room, which extends to a shaded porch and outdoor patio, is pleasantly busy but not overcrowded, due to the carefully managed reservation system. We were promptly greeted and seated at a table on the porch, pre-set with flights of wine glasses. Toddlers romped on the lush lawn: Children are welcomed and provided with juice boxes and custom coloring pages, should the natural attractions pall. Dogs are permitted too but must remain leashed. The winery and tasting room are fully ADA compliant. A comfortable setting, of course, is not all that’s required for a truly hospitable experience. The moment our server, Seth Stanton, arrived tableside, we felt catered to and coddled. The $25 tasting menu was red wine heavy (not surprising for Napa Valley): Frog’s Leap’s best sellers across all channels are estate Cabernet Sauvignon, Zinfandel and Sauvignon Blanc. When I explained my inability to enjoy too much heavy-duty red—high tannin makes my nose run to an uncivilized extent—Stanton immediately suggested an alternate white wine flight. Later, he suggested we try La Grenouille Rougante, a gorgeous dry rosé blend of Valdigue and Zinfandel, which retails at a shockingly affordable $20 per bottle. We contentedly sipped while munching flatbread, local cheese, dried fruit and California almonds. Stanton answered not only our wine questions, but queries about the grounds, too. A bonus: He was also very funny. It was an altogether blissful couple of hours, and we would have happily stayed for lunch, but Frog’s Leap is not permitted for food service, nor does it offer music. Hummer said: “We are in a very serene setting. We encourage folks to enjoy the natural sounds of the property,” which include songbirds and free-ranging chickens. Every tasting room has different attractions and amenities. Becoming exemplary and sustainable requires a higher level of attention. Recruiting, training and retention: Recruiting servers in the heart of Napa Valley is not as difficult as it is in lesser known wine regions. On the other hand, so many opportunities and so much competition can make it hard to retain the star sellers. Training is very important, and the winery closes for two full days in February, when Williams and general manager Jonah Beer dedicate themselves to the hospitality department. Training includes intensive comparative tastings, winemaking seminars, tours, staff outings and lunches with reading assignments and tests, culminating with a dinner at Williams’ home. Daily pre-shift lineups sometimes include pop quizzes. In the slow season, employees are sponsored to visit other valley wineries on company time, concluding with a staff meeting to share experiences. Incentives include two annual outings when the entire staff enjoys team-building with food and drink, and a benefit package that includes personal time off and holiday pay, wine allocations and a gym stipend. A possibly related fact is that Frog’s Leap enjoys wide distribution and, only about 25% of wine sales come via the direct-to-consumer channel including tasting room, wine club and online. What else is on the market? Tasting room merchandise is very unobtrusive, by design. Farm products are the biggest sellers, including jams, preserves, spreads, hot sauce and olive oil. Branded ball caps, wine keys, etched wine glasses and decanters are also on display. Frog’s Leap’s glasses are made by Riedel, and they’re cleaned in a Hobart dishwasher. Since new bottles are opened daily, no nitrogen or other preservation devices are employed. Playing music legally can now be less expensive for wineries, thanks to a new agreement forged by Wine America and ASCAP, the major music licensing agency. Check here for details. The PlumpJack Group opened a winemaking and hospitality facility at its newly acquired 82-acre vineyard property on Howell Mountain in Napa Valley. The site will serve as an extension of CADE Estate Winery and offer library tastings, new releases and large-format wines. Remy Drabkin will open a new tasting room at Lone Madrone Vineyard in Oregon’s Dundee Hills. The site in Dayton, Ore., will be open from noon until 5 p.m. daily and include wines from the Remy and Three Wives labels. Sans Liege Wines of Pismo Beach, Calif., opened a satellite tasting room in the Tin City complex in Paso Robles, Calif. Winemaker Curt Schalchlin will make use of the 6,500-square-foot wine-production facility at Tin City, and the tasting room will be open daily from 11 a.m. until 5 p.m.
Condiment manufacturer Fischer & Weiser is opening a tasting room inside an 1800s log cabin from in Fredericksburg, Texas. The food company will serve its offerings along with wines from almost 50 local wineries. For more information, visit daspeachhaus.com. Byington Vineyard & Winery of Los Gatos, Calif., is now the first winery to have a tasting room in nearby Los Altos. The hospitality facility opened to the public June 17. Byington also offers tours, barrel tastings and special events at its main location in the Santa Cruz Mountains. Hoffman Farms Winery & Tasting room held a grand opening June 10, 14 months after its previous facility was destroyed by a fire. The event included a ribbon-cutting for the new hospitality venue, which is part of a working farm in Highland Township, Mich.
Mantra Wines held a grand opening at its new tasting room in Novato, Calif., on June 24. The 4,000-case winery was founded in 2000 and now will pour its wares in the old First National Bank building in downtown Novato. Equality Wines of San Diego, Calif., will open a tasting room in the Northern California hamlet of Guerneville, Calif., this month. The winery donates a portion of its profits to progressive causes, and its quaffs include Stonewall Cabernet and Love Wins Cuvée. Callaway Vineyard & Winery of Temecula, Calif., is opening a satellite tasting room in the Gaslamp Quarter of San Diego, Calif., according to eater.com. The tasting room will be open seven days a week with late hours on Friday and Saturday and will offer flights created from Callaway’s list of wine offerings.